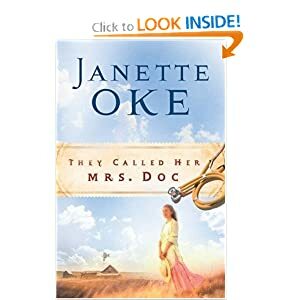 They Called Her Mrs. Doc is a bittersweet love story. Bitter because all lives must eventually come to an end here on earth and loved ones left behind, but sweet because of all the years enjoyed together, loving, trusting, helping. A young woman discovers she is dissatisfied with her established and promising social life in the home of her noted physician father. She has her choice of promising young doctors to choose from who regularly dine with her family as her father’s protege. Yet none of these exciting, young men seem to appeal to her until she meets a more unlikely young man who is neither wealthy nor schooled in social graces. However, his honest and sincere desire to return to his home town to serve the people there in his medical practice wins her heart. Now if only she could convince him to return to the “city” where the real life is after a year or two. She can never imagine herself feeling satisfied with this sleepy little town. However, the magic of these people in this small town works wonders on her heart and soon she begins to wonder how she could ever live any place else. A wonderful story that could have been set in many of the quaint small towns across the Canadian west. It displays many of the idealized qualities of small town life and gently develops the readers love of this town and its people as well. I loved well and also cried hard during this book! It was a great read!! !